Studio Wildcard is bringing the holiday spirit to Ark: Survival Evolved with festive home decor, Raptor Claus, and for the bad girls and boys, possibly even a DodoRex, complete with a cheery red hat. 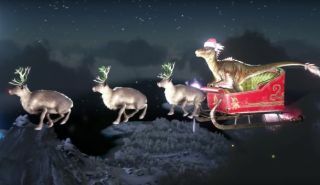 "Raptor Claus will dart across the night sky in his sleigh, air-dropping presents filled with high-end Loot Blueprints (or Coal for naughty Survivors)," according to today's announcement on Steam. "We suggest following him around to stock up, including on rare dropped Ark Gift Codes! Survivors also can earn Reindeer Costumes, Candy Cane Club Weapons, Santa Hats, and if they collect enough Coal, they might even be able to summon the elusive holiday-themed DodoRex to do their bidding for a limited time!" I'm guessing that chasing around after Raptor Claus to scoop up his drops will also lead to the occasional bumping of heads, exchange of words, and perhaps a massacre or two, but hey, if you're not killing people, you're not trying hard enough, right? It's all part of the fun. Speaking of which, Studio Wildcard also announced the final Survival of the Fittest battle of 2015, which will pit two teams of 100 players against each other in a "Naughty or Nice" elimination battle. The players of the winning tribe will be given $10,000 to divide and donate to the charities of their choice. The Survival of the Fittest Naughty or Nice Event kicks off at noon EST on December 29, and can be seen on Twitch. Ark: Survival Evolved is currently on sale for $18 as part of the Steam Winter Sale.